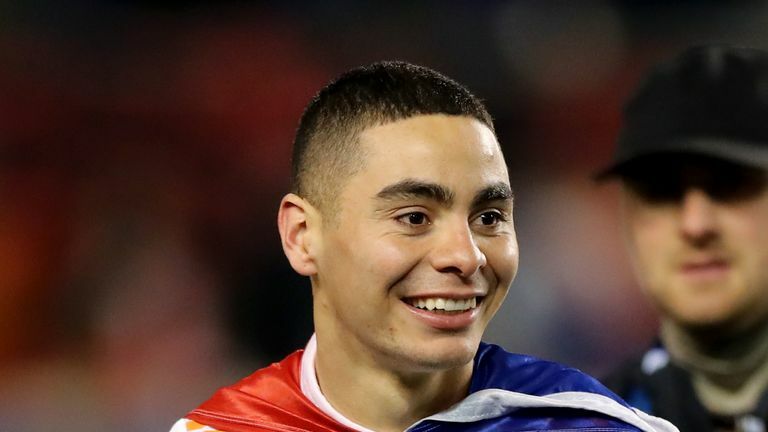 Newcastle's club-record signing Miguel Almiron says he is "anxious to get going", but has no such worries about his transfer cost. The 24-year-old has joined Newcastle from Atlanta United on a five-and-a-half-year deal for a reported £21m, breaking their previous transfer record - the £16.5m signing of Michael Owen from Real Madrid in 2005. Almiron, who will wear the No 24 shirt, has been a transfer target for Rafael Benitez since the start of the January window and the Paraguay international is delighted to have finally completed the move. "I am very happy to be here and I just want to work together with the manager. I don't really think about the numbers, that is not my thing," Almiron told Sky Sports News. "It happened really quickly. I am really happy to be here and I'm anxious to get going." Asked if he was ever worried that the deal, which was completed on Deadline Day, would not get done, the midfielder added: "No, I wasn't thinking about it a lot. I am just really happy and honoured that Rafael Benitez and the club wanted me in the first place." Almiron, who has not played since the end of the MLS season in December, says he will work hard to be ready in time for Newcastle's trip to Wembley to face Tottenham on Saturday. "I don't decide that but I am working really hard to be able to play," he said.